Enriched by our vast industrial experience in this business, we are involved in rendering EPC Contracting Service for our customers. Moreover, provided service is widely praised for on-time execution. The drives control constant torque applications such as conveyors, mixers, extruders, winders, warehouse lifts and overhead cranes in the food and beverage and material handling industries. They require little setting up or commissioning. 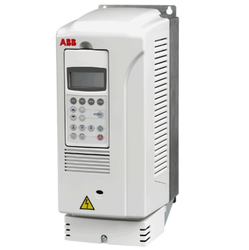 In addition to the intuitive control panel, the ACS380 offers a control panel with an icon based menu for easy and smart commissioning of the drive, getting the drive ready for action. The drive is easy to connect to automation systems. All the essential features are built-in as standard, which reduces the need for additional hardware and simplifies drive selection. We have been counted amongst the most trusted names in this domain, engaged in rendering EPC Contracting Service. NIPPEN Model UNO+ is used for measurement and control of PF using Reactive power compensation. Capacitor banks are suitably switched ON and OFF automatically to provide necessary compensation. An Intelligent switching algorithm (Wear leveling) ensures uniform aging of the capacitors used to achieve the Target PF. An Alarm function ensures protection of capacitor banks against abnormality in voltage, current and sets value of capacitors whenever these are beyond the higher and lower threshold limits.CT polarity is automatically sensed internally in the event of reverse connection. Target PF Programmable both Lead & Lag. Password Protection for Set Values. Individual CAP can be programmed ON-OFF-AUTO. Automatic disconnection of all caps in case of Mains failure. Reliable performance at Low Current. Clear History of Capacitor ON Time. V, A, P F, kVAr, kW & kVA. KEY PAD 4 keys for scrolling through display pages and programming functions. Clear History(ON time data of each CAPACITOR). Up to 4/6/8/10 stages with stage indication. (Unique Models UNO+4R, UNO+6R, UNO+8R, UNO+10R). The MAXIMUM DEMAND CONTROLLER indicates MAXIMUM DEMAND (SANCTIONED), TARGET DEMAND, PRESENT DEMAND, DEMAND FORECAST & REMAINING USEABLE DEMAND & REMAINING TIME DURING ONE CYCLE. THESE FEATURES ARE MOST ESSENTIAL FOR PROPER DEMAND MANAGEMENT. MAXIMUM DEMAND : It is the Maximum Demand which is sanctioned by the electricity authorities at the time of application for sanction of load. e.g. 1000 KVA. TARGET DEMAND : It is the Maximum Demand value which we do not want to exceed. If there is no power cut, Target Demand is equal to Maximum Demand. If there is a 25% power cut then Target Demand will be 750 KVA if Maximum Demand is 1000KVA. PRESENT DEMAND : It is zero at the beginning and increases as the load increases within the time interval of the demand period (=30 minutes). At the end of this period it returns to zero. DEMAND FORECAST : According to the variation in the connected load this display will indicate the Maximum Demand which will be reached at the end of demand period (=30 Minutes). This will allow the user to plan the load pattern in accordance with the demand forecast, so as to avoid exceeding the Target Demand. USEABLE REMAINING DEMAND : According to the Current Maximum Demand (connected load) the Demand Controller will calculate the Usable Demand which can be used by the consumer in the remaining demand period (=30minutes - time elapsed) such that the Maximum Demand is within the Target Demand Value. e.g. if the target demand is set at 750 KVA and the demand period =30 minutes, then at the beginning the useable demand = 750 KVA & the time display = 30 minutes. If the load is 1200 KVA at the beginning (more than the Maximum Demand and Target Demand), then the usable demand shall get reduced from 750 KVA, in the remaining time. 10 Minutes later, if the load is not changed, if the useable demand displays 600 KVA, and the remaining time displays 20 minutes, it means that the useable demand in the next 20 minutes left is 600 KVA. If the current load is not reduced from 1200 KVA to 600 KVA, then there is a risk of exceeding the target Demand 20 minutes later. Therefore current load must be reduced so as to reduce the KVA. On the contrary if the load is less than 750 KVA in the beginning, then the usable remaining demand shall increase. If the useable demand displays 1000 KVA and the remaining time displays 10 minutes and the current load is 600 KVA, it means that 400 KVA more load can be connected for the remaining 10 minutes. The user can self arrange or adjust the load in accordance with the above explanation, so that the user does not exceed the Target Demand. 4 Relay outputs for Demand Control : In this instrument we can set the TARGET DEMAND (approx. 10%) below the SANCTIONED Demand. When the present Demand exceeds the target demand, the relay output switches ON. These relay outputs can be connected to least priority loads. When the relay turns on, the loads are switched off. When the present demand falls below the target demand, the relays switches ON the loads one by one. Delay time can be set for the relay control. Thus the present demand never exceeds the sanctioned demand & the customer is saved from paying penalty. 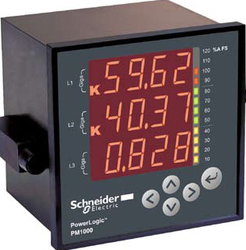 This instrument displays the remaining usable Demand, so that the load schedule can be programmed accordingly.